It was September 7, 2017 and I had just sent out my first newsletter in 8 months. I had also just updated my home page content for the first time in nearly two years. I wanted to update what I had been up to that year (2017) but didn’t get much farther than mentioning those two things. I stalled out again until attempting to pick up the thread again today. So I’m going to condense the past two years as much as I can, because I’ve gone through a heap o’ changes during this time, many of which will continue to affect my work and what’s available for you! Transitions are never easy for me, but I’m just happy to say that after a very tumultuous stretch, I’m feeling better—mentally and physically—than I have in quite a while! So here’s an update on at a few of the highlights of the past two years. A friend I hadn’t seen in a while asked me this question at a recent get-together. “It’s complicated,” I answered. Little by little, I’ve been shedding the pieces of my work that have gotten too complex or too exhausting, and I’ve been enjoying my involvement in what remains. We’ve returned our tax status to a sole proprietorship and will no longer be selling books directly through the site as our stock clears. (Details below.) Other than doing presentations from time to time, I’m claiming to be “randomly retired” and will be letting go of almost everything else. And speaking of presenting, this past summer, I was invited to speak in Bogotá (Colombia), which was not only a wonderful experience with a fantastic group of teachers, administrators, and school owners, but also gave me bragging rights for now having presenting on five continents! Woo hoo!! So as far as retiring the speaking part of my career goes, the answer is no. That part will stay! Since my first book was released in 1982, I’ve come out with about 20 titles, including new books, new editions, workbooks, and facilitator’s guides. The last book I wrote came out in 2015 to great reviews and very slow sales. This book took up three years of my life and I’ll stand behind every word I wrote in it. That said, I just don’t have the motivation to do another one right now. I spent about a year writing for a blog, which was a fascinating process—learning how to write 1500-word pieces for the “bullet-point” crowd. But I don’t know that I learned or gained enough traction to keep that going, other than to apply the experience to freelance pieces or to what add to this site. Meanwhile, I found a number of unpublished projects and a few from years ago that have long been out of print (but, with a little sprucing up, could be viable projects). Likewise, I’ve gotten the rights back to a few of my titles, so if I do much work in this area, it will primarily be a legacy project, making the books available as ePublications and print-on-demand through Amazon. I’m working with someone who has been helping to convert material, and although we’re off to a very slow start, I actually have a pretty hefty stack of material that I intend to make available in the coming year or two. So I’m more likely to be re-writing than writing, but more resources are on the way. We have sold books at my presentations and through this site since we started this business. Of course there was no such thing as online retailers in the early 80s and free shipping was almost unheard of. Grateful for the success and following we’ve experienced over the years, I find that with fewer speaking engagement and intense competition from online resellers, I’m ready to let this bit go. Another hard call, but it truly is time to close up shop and clear out the inventory we have on hand. I have reduced the cost of all stock and am now offering select copies of free books for the only cost of shipping. As titles sell out, I will provide links to point people to Amazon, where most of my stock is sold anyway. One major change in 2018 was a decision to dis-incorporate. I started out as a sole proprietorship in 1982 and incorporated ten years later. 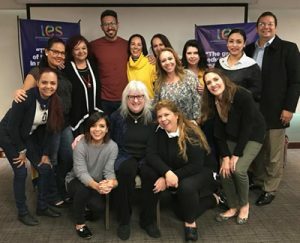 2019 represents the 35th anniversary of Instructional Support Services (!) and as of the new year, we can replace “Inc.” with “LLC.” Onward! I’ve been going through home and office spaces, downsizing papers and possessions bit by bit for the past couple of years. Although this process kind of fizzled out while I was dealing with my mom’s situation, I still have two closets and the garage, which I’ve managed to successfully avoid dealing with until now. As our history page mentions, I launched a very basic website in 1997 and as the technological demands continued to evolve, created several other versions over the years. For the 2012 edition, I wanted a few features—specifically a search field and drop-down menus—that were beyond my coding skills, so I switched to WordPress and hired Tom Todd to help. Although I’ve always been pretty involved in the design and coding, I just handed over the reins over to him to “make it work,” so for the most part, if you like this design and structure, you can thank him. What you are reading now is official the fifth iteration of this site. I will continue to add content as the mood hits, and in the meantime, there’s a ton of content here. I assume that this will be my last major go-round, though I will keep the site alive for as long as it works and as long as there is a need for the content people can find here. About half of the space in my warehouse, the back room where we store inventory and fill orders, has been converted into a place to work on stained glass and to store wool and roving for spinning, two of many hobbies that have been calling me lately. 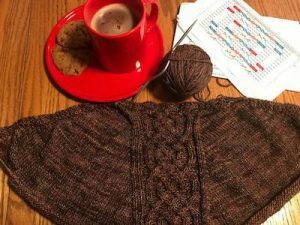 Bringing in 2019 with hot chocolate, cookies, and my current knitting projectt! Although rebuilding the template for my newsletter does have a creative feel to it, my hands are hungry for something beside a keyboard. I’m going to jump ahead to New Year’s Day 2019 (left) to share how I spent my day, with the intention to balance my priorities a bit better. This past year dealing with the changes in my mom’s life has moved all-things-work way down the priority list. Likewise, the reduction in travel during the past two years allowed for more contact and networking with other crafters, designers, and artists, which has kicked a different kind of creativity into gear. As always, I still have many loose ends to tie up and as I’ve been enjoying working on the site and newsletter again. I am still open to opportunities to speak, though I feel a different rhythm settling in. And for now, this feels like a good thing.